The golf course exploding to the 1812 Overture at the end. Bill Murray’s over-the-top character, specifically the self-narrated cabbage-mutilation scene. The old man’s best round of golf in the hurricane, culminating in a lightning strike. Rodney Dangerfield’s awkward, ridiculous golf swing and his awkward, ridiculous eyes. Having loved this as a child and having just watched it mere days ago, I am now questioning just what else I’ve been able to trick myself into believing over the years. This is not a good movie. I question whether or not I ever really liked it now. It’s possible because I haven’t seen it in about 25 years that I just bought into all the cult hype that has strangely grown over time and merely assumed I liked it. Or more likely, just said I did to fit in (he was even more insecure back in high school). Sure, Murray and Dangerfield are still funny if you enjoy cartoons and/or fart jokes. But I don’t. This movie was made in an obviously different time period of feature length film. One in which sound mixing was just not important enough to the editors. I’m not a proponent of the MTV quick cut version of film, but the pacing in this was ridiculous. What the hell was with the boat scene between Dangerfield and Ted Knight? It was 5-7 minutes of wasted time and probably not much money. In 1993, Universal Studios had the guts to cut a multi-million dollar scene of the island blowing up at the end of Jurassic Park. I don’t see why they couldn’t have thrown away a glorified dinghy for the sake of continuity. And the pool scene was so overhyped in this documentary. Another wasted 5-7 minutes. No laughs, no plot development, no reason for it to be in there. What a let-down. Speaking of plot, there apparently originally was one. Because of the need to get all these stars more screen time, the producers kinda threw it away. This is the reason, but still doesn’t grant them a pardon. 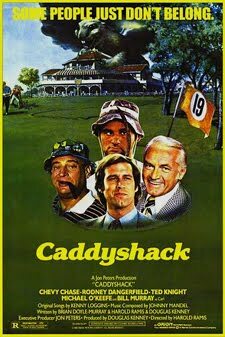 Rodney Dangerfield, Bill Murray, Chevy Chase and Ted Knight are all in this movie and none of them are the main character. When watching this again, I really could care less about Michael O’Keefe. So much of the plot was trimmed out in favor of Dangerfield’s eye bulge and Murray’s mumbles that I couldn’t root for his character’s ambitions or desires. And what the hell was the point of the broad? She banged both Chase’s character and O’Keefe’s character and that was it. No development, no explanation. I’m all for gratuitous slutiness, but there wasn’t even an attempt to make it make sense. And that theme followed the film throughout. I still enjoyed the parts that I remembered. 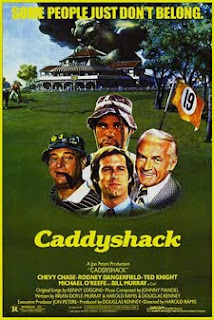 I especially enjoyed the documentary glancing a little too casually over the part where they took the golf club owners out to dinner and blew up their golf course. And like Harold Ramis – first-time director – said, having an animatronic gopher dancing in the first scene kinda let them off the hook for having a plot or following any kind of rules whatsoever. I do not want to rid the world of all copies of this movie, I just want to get it out of the #2 spot on ESPN’s best sports movies of all time (below Hoosiers) and the #2 spot in Bravo’s Funniest Movies of All Time (below Animal House. Of course, any list with Arthur in the top 10 can probably be completely discounted). 4 bugs (out of 10). I never liked the movie.